Focusing x-rays and gamma rays can be difficult. They are not refracted much, mirrors don't reflect them (except possibly at grazing angles), and most materials absorb them. One option is a zone plate. 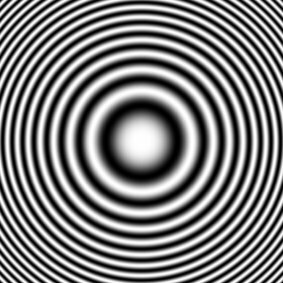 As you may remember from the section on diffraction, light waves curve around barriers. You can exploit this to make a carefully shaped barrier that curves the light such that it is focused. these usually take the form of carefully spaced concentric rings of controlled width. The simplest zone plate is shown at left. It has a disadvantage - it will absorb at least half of the light that falls on it. Further, simple zone plate shapes do not focus the light efficiently - much of the light ends up scattered into side-lobes. Thus, less than half of the light is focused where it is wanted. If the zone plate has a gradient in how much light it absorbs, as shown to the right, it is more efficient - up to half of the incident beam can be focused (with the rest being absorbed). Sometimes, though, 50% efficiency is the best you can do. Visible and near visible light zone plates can be made more efficient by using refraction instead of absorption to diffract the light. Since no light is absorbed, more light makes it to the focal point.